If improvements in data are to lead to changes in peoples’ lives, then data must be accessible and able to be used. Governments need data for planning and monitoring what they do, and people need data to hold those governments, and other institutions, to account. Campaigners for open and transparent data have been successful in persuading many governments and non-profits to open up their data and make it available in ways that data sets can be easily used. There are many good examples of new ways of opening up and using data to drive real, tangible changes in people’s lives. Conversations are moving on from ‘whether’ data should be made publicly available to ‘how’ they can best be opened up, standardised and made more meaningful. Production of disaggregated data that can be sliced and diced by gender, race, disability or age is also invaluable in supporting accountability and human-centered policymaking. However, all this costs money and requires new skills and new ways of working. Getting the basics right, including filling data gaps, increasing timeliness and setting common standards to make data more accessible and useful to people. What are the priorities? Who needs to do what? Capacity building: what should be taught in schools, what new skills are required in national statistical offices, and how can individuals and organisations become more able to collect and use data to drive action and accountability? How can the owners of data in both public and private spheres be encouraged or required to make data more available to whoever wants it? Thanks for creating this space for discussion and the thoughful prompts. Think about the primary data user – when standards are being developed it is important to think about whose needs those standards are tailored towards, and what space they give for flexibility and local contextualisation, as well as generating comparable data. Focus on capacity for action – the data-related capacities needed in civil society are not just data literacy capacities, but also the capacities to connect data with various forms of social action – including monitoring governments and corporations, generating policy ideas and feed them into debate, and campaigning for change. Focus on accountability AND collaboration – strengthened statistical offices and government data functions may also need a strengthened culture of collaboration to work with citizens and communities outside government on creative problem solving. The potential of open data to be used in innovative and generative ways should not be overshadowed by an exclusive focus on data as a tool of monitoring and accountability. There’s more detail in the post linked above. I hope these are useful inputs – and we would be very happy to look with the partners of the Open Data Research Network at ways to further contribute to constructive thinking, discussions and debate around the data revolution. I agree with all three points, yet regarding the 2nd, one should not forget “economic activity” as a locus for the action. Business is an important actor in a global partnership, and a strong potential partner in the data revolution. The “monitoring-reporting-verification” must be seen as part of a “public-private space”, rather than as a purely “public sector” exercise. I agree that the role of private/corporate enterprise in developing open data frameworks and standards needs to be considered. Tech-companies are likely to have a strong say in the development of data standards, simply because they host much of the daily data flow between people. It will be necessary to balance the value of their expertise with the need to maintain a open, flat and transparent playing field with equal access for individual citizens as well as corporate entities. Regarding “Focus on capacity for action”, the data-related capacities needed in civil society must including the means to understand what governments/corporations are able to do with the data they obtain from people. Only with a true understanding of the value of personal data will it be possible for people to make an informed decision about which data transactions they want to participate in. Regarding “Focus on accountability and collaboration”, “the potential of open data to be used in innovative and generative ways” will require developing ways for managing input from uncoordinated large number of sources (individuals) to find common ground. Some work towards this is being developed in the EU FP7 “D-Cent” project and the “Liquid democracy” project. a. If the objective in opening up data to the public is to expand access to information in such a way that new actors are drawn into governance processes thereby improving operations and decision-making (Helbig 2012), then opening up data to the public should first and foremost consider who among the public the intended audience of the open data initiative is, and what sorts of information do they want to be provided as open data sets. b. Data owners in government should be educated that publishing data in machine-readable format does not change the content of original documents, even when users tamper with those that are provided in the websites. Original documents will still be the legally valid documents. They need to be assured that what subsist as valid data will be those that are contained in their current reporting systems. Also, there has to be an incentive mechanism in place that would encourage openness. c. Critical to the success of open data initiatives is the upward push from its intended users. Open data initiative is a failure if the data is not used. In this case, infomediaries may also be critical. Some citizen groups may be able to access and use data but others may not. The conversion of open data sets into something that can be useful for policy, advocacy, or education work may not be a skill of all citizen groups. Thus, nurturing the role of infomediaries is also a critical part of open data policy or program. In a context where infomediaries have limited skills, this conversion and communication process needs to be mediated through context-specific capacity building. d. The impact of open data beyond the online community needs to be extended. Open data initiatives should promote offline citizen use and engagement (Lee and Estefan 2014) to make it more inclusive. Again, in this case, the role of infomediaries is critical in order to translate open data sets into formats that are accessible to offline communities. Regarding a) with more sustainable development goals and targets, the “intended audience” of the (open) data will be larger than with such a few goals and targets. One way of reaching niche groups with contemporary social media is by using hashtags. Just check #SDG17 on Twitter, #isic8413 or #isic0112 – Growing or Rice, or #isic0112PH – growing of rice in the Philippines. It is not easy to remember all tags, but people will easily remember the tags that matter to their livelihood, and when they need information in another area, they visit a “domain navigator” pointing at the tags for the topics of their current interest. knowing the intended audience is also important for knowing how to present the data. Data literacy is not only about teaching the receiving side how to think about data, but also about knowing how to present data in a way that increases transparceny/readability rather than ubfuscating through an impenetrable forest of data. Access to the forest must not come at the expense of being abel to see the trees (when necessary). 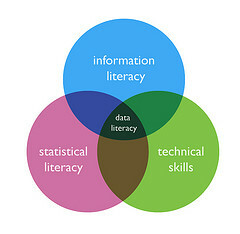 As stated above under point “c.”, the conversion of open data sets into something that can be useful for policy, advocacy, or education requires communication skills that commonly require the expertise of “intermediaries” such as journalists skilled with producing insightful infographics. Open Data is freedom to work with any data for anything. The Open Data Research Network, leaded by Tim Davies focus on how developing countries have been opening theirs governments and how civil society, enterprises and journalists have been using the data for development. I welcome the acknowledgement of the importance of norms, incentives and regulations to encourage and require the owners of data to make it publicly available. However, this initial acknowledgement seems to get lost when the discussion turns to suggestions on scaling-up successful approaches and input. I would caution against losing sight of the importance of norms, incentives and regulations. More serious […] is the disconnection between people’s capacity to decide their lives and the nature of the institutions that are supposed to implement […] programmes. This is ultimately the most important problem of development. In fact, in the interests of the developmental state, what is required at this point is the development of society, with people taking development in their own hands. And they are doing it […] but not through institutions yet. We are in the process of historical transition, caught in a very special moment in which the existing economy is highly dynamic. Human development […] is improving and increasing, but the actual perception of this and the living conditions of people are deteriorating. The main reason for this is violence, fear, institutional crisis, the predatory state, corruption, and inability to feel safe because those who are charge of making you safe are themselves the most unsafe institutions. Under such conditions what is happening is that we enter a period of historical transition in which people resort to the oldest forms of social change in humankind’s history. We take it into our own hands: we confront the institutions; we try to solve the problem by ourselves. Open data is often touted as having the potential to increase transparency and, in so doing, enabling civil society to hold institutions more accountable for their decisions and actions. In others words, instead of being confronted by and potentially immobilised by a fearful and frustrated citizenry, institutions can restore trust by enabling openness in order to engage with citizens. However, from an open data perspective, we believe that too little attention has been paid by the open data movement to the institutional dynamics of governments and other public agencies such as universities and the judiciary; nor has the research community drawn sufficient attention to the institutional dynamics at play in the implementation of open data initiatives in public agencies. In fact, the argument is made by some that introducing new technologies (including opening government-held data) may well serve to reinforce existing institutional norms and structures – and in the case of government, command and control rather than openness and accountability may be reinforced as open data is perceived, used and implemented within existing institutional arrangements. From such a perspective, it would be erroneous to regard open data practice and being synonymous with open government. In addition, the rate of change demanded by movements such as the open data movement, could be described as being at loggerheads with the rate of change in institutional domains. Given the promise of open data – that is, the potential of open data to increase the credibility of institutions in the eyes of citizens through greater the transparency and greater accountability – we would suggest that the open data movement needs to develop a more nuanced understanding of how to institutionalise open data practices. Just to emphasize points already made by Tim and the rest, part of getting the basics right is focusing on the users and what data/information needs they have and then working to meet these needs. By so doing many other issues come into perspective notably relevance of the information/data and the contextualisation of open data (political, social, economic, technical etc). As reiterated in the recent Buntwani conference data is not important to the people – people are. The challenge remains developing a sustainable ecosystem of intermediaries that can translate data into meaningful information, services, tools etc with the end users in mind. I believe that the focus should be on teaching people to interpret data. If this starts at the primary level it will become second nature. The intervention must begin in the teachers’ colleges because if the teachers can’t interpret data they will not be able to understand why this is important nor will they use it. All new concepts ought first to be introduced in teachers colleges….they are the catalysts. I agree to teach early. The #tags I explained in an earlier comment are almost as easy to use as Google search, yet they have one benefit over the reliance on search and that is that people/organisations who have something to contribute can do it by simply using the tag, no need to be famous or have “search engine optimisation” skills, in order for the contribution to be discoverable. le développement repose sur la disponibilité de statistiques fiables. la production des statistique fiable passerait par l’appropriation des TIC par les ménages, les entreprises, les administrations et les collectivités locales. En Afrique, l’Union africaine et les Cers doivent définir un Plan Stratégique de l’Administration électronnique avec le développement de système d’information à même de produire des données fiables pour les besoins de la plannification strattégique. Notre association met en place au Sénégal un partenariat pour le déploiement deux clusters: un à Dakar et le second en Casamance. Nous pensons que c’est la production de données fiables, à l’échelon local, qu’il faut explorer la solution globale. une telle démarche réservera aux agences nationales l’analyse et le traitement des données. the scaling-up successful approaches and input’s may sometime lose sight of the importance of norms, incentives and regulations. But it is workable. CIIT may play a critical role as stable, enduring social arrangements that provide the rules, practices and structures that shape the society trusts to disburse their public service responsibilities. The trust and relationship between society and institution play a major role to control to improve their daily lives, Framework can protect the privacy of individuals without hampering life-saving uses of data science for public good. It is a challenge for develop a sustainable data into meaningful information, services, tools etc with the end users . COMSATS Institute of Information Technology (CIIT) is acknowledgement of the importance of norms, incentives and regulations to encourage and require the owners of data, the scaling-up successful approaches and input’s may sometime lose sight of the importance of norms, incentives and regulations. But it is workable. CIIT may play a critical role as stable, enduring social arrangements that provide the rules, practices and structures that shape the society trusts to disburse their public service responsibilities. The trust relationship between society and institution play a major role to control to improve their daily lives, Framework can protect the privacy of individuals without hampering life-saving uses of data science for public good. It is a challenge for develop a sustainable data into meaningful information, services, tools etc with the end users . The primary data users are four: academic, government, business and media sectors. In normal situation, there is only national government and its health, population, education and economic (including trade, industry, investment, ….) agencies are creating and maintaining data banks. Many developing countries charge data fees for the purpose of continuation of data creation and maintenance. I am somewhat pessimistic on open data initiative in low to median income countries (LMCs). However UN can encourage at least government data set open to college professors and students for projects supporting by UN organs. Users fee charging to business and media are reasonable because their purpose of using data is to make profit. The government officers in LMCs have more data illiterates due to lack of good computer facilities, staff training in statistics and computer programming and a nationwide statistical monitoring system for people’s wellbeing. Those facilities and teachers need spend government budget or business donation to improve. I will encourage UN Statistics Division (or SDSN? ), UNDP, UNEP, UNESCO, UNIDO, World Bank, WHO together to enhance such training programs in those countries with full or half financial support. It would be the best if UNESCO can provide standard college curriculum on data bank and its analytical methodologies (in primary, intermediate and advanced levels) for their reference. If the UN report submitting is not satisfied, there may be necessary to enforcing the replacement of disqualified professors from top one or two universities in the country (or a statistical alliance of neighboring countries, for the sake of dealing with the situation of small countries without scale economy) . Gradually the situation will be improved. As to data banks of individual persons or firms, it is necessary for users to trace effects by gender, race, disability or age in supporting accountability and human-centered policymaking. Nationwide census data banks have those features. However it is conducted normally every decade only. For countries with obvious health or education vulnerability and/or pollution or energy wasting, UN organs need ask for extra three or five year survey for intermediate term report. Finally but not the least, only national data is not accurate enough to evaluate the performance of MDGs of each country. Each databank (so as the report to the UN) must guarantee the spatial id (i.e. spatial hierarchy from large region to province, city/county, town/district to neighborhood/village) be identified. In this way, we can identify the best performing vs. the poorest performing areas in the country so that every money can put into right areas and with most capable professionals from its own country for UN projects. I am disturbed by these questions, the way they are being asked, the attitudes and worldviews that inform these questions and also with some of the responses. History is not a recreational subject, and one thing every educated person should know from studying history, is that information is power and too much power in the hands of leaders, ‘experts’ and decision makers always does far more harm than whatever good they may have theoretically done with it. The past actions of the different agencies involved show a clear pattern of dishonesty and corruption, regardless of the humanitarian rhetoric that has been used to justify institutionalist intervention, the outcome has largely been detrimental to the people they claim to help and primarily benefit the professional/corporate and other institutional interests in control of the decision making process. However, the ‘data’ collected has always been done in such a way that it makes the outcome look good on paper. An example is how different UN agencies have cooperated with corrupt government and western business interests to force people off their land at gunpoint and give it away to western agribusiness groups to grow food for export while allowing malnutrition to run rampant and sending token aid while forcing them to move to the cities and live in crowded squalid conditions working most of their waking hours or in total destitution, because the ‘economists’ don’t want there to be an in-between because creating desparation is part of boosting the ‘economic productivity per person’ quotient. The rhetoric used to justify these crimes in various reports and propaganda outlets centers on the idea that they are ‘ending poverty’ by depriving people of the land they’ve lived on for generations because, after they’re robbed of their property, to forced to work for someone else and get paid ‘dollars’, barely enough to live off of, but more dollars on paper so the UN can say ‘look, we’re ending poverty’, and they can say ‘those poor rural farmers don’t have ‘enhanced water sources’, because they get their water from wells and streams as people have done for millions of years, since it’s free, but by allowing western controlled industries to pollute water and creating conditions that make disease spread worse, western institutionalists have an excuse to justify privatizing water supplies and thus turning what is free and rightfully belongs to all of us into the private property of wealthy western economic parasites. Once forced into the crowded cities, they are considered better off because the giant prisons they are forced into happen to have electric lights and stupid western influenced consumer products are available to them means they are better off as far as the ‘data’ is concerned, even if they are miserable. Oh, that’s right, if they’re miserable, it’s a ‘mental health crisis’, and the statistics from that mean they need to force people onto drugs that numb their emotions so they can cope with life in the prison of ‘prosperity’ as defined by the experts and their carefully selected ‘data’. Then, in every country where malnutrition is a common health problem, there is food being grown for export to countries where obesity has become a health crisis and food is routinely wasted, and the UN ‘experts’ response to this is to force the farmers to grow certain crops that western businesses want them to grow, and force them into the patented seed trap using falsified research created by unethical western companies. While the dishonesty and false motives of many of the political and business leaders who infest all of the world’s decision making processes is quite blatant, there is also, sadly, genuinely good people who do a great deal of harm because of the ideology fostered by powerful elites. This institionalist ideology, the absurd notion that everything is inherently better when it’s done one single way, that everything can and should and must be standardized and institutionalized and regulated and made the subject of some form of ‘expertise’ or profession, simply so that a smaller number of people can be in control of every single process, undermines any good intentions the institutionalists may have. Maybe enhanced data collection would be a good thing if the world were governed by good, honest and rational people, but this is a horribly dangerous and altogether wrong to put in the hands of the the wealthy elites who rule today, or the cult-like ‘civil society experts’ that work to maintain their power. At the UN-REDD Programme, we are strengthening our Knowledge Management systems and tools in order to build the REDD+ readiness capacity of partner countries, as well as the REDD+ knowledge and related capacities of other stakeholders. We also believe, as many other commentators have noted, that information must be made readily available to stakeholders in order to enable them to participate effectively in social change initiatives. We also believe that it is equally important that the information shared be relevant to these stakeholders — it must meet their needs. As others have highlighted, sharing data for the sake of sharing data does not always realize impacts. It must be the right data shared with the right audiences in order to be relevant and drive real change. We also believe that the delivery tools used for sharing this information must be relevant to the target audience — as otherwise it may not be easily accessible to them, or easily interpreted. For the above reasons, the UN-REDD Programme has made the strategic decision to link its Knowledge Management and Communications capacities. We realize that while our KM experts may be able to identify and capture key information that is needed to be shared, that it is our Communications experts that have the expertise to identify key audiences, relevant tools and methods for communication the information, etc. The Communications piece of the equation should not be underestimated. We, therefore recommend that the Secretary-General’s Independent Expert Advisory Group consider: 1. the information needs of stakeholders, and 2. the role of Communications in the design of a systems and processes to create a “data revolution for sustainable development”. Too often we as researchers collect data in response to a specific request from industry, government or other stakeholders – data can then be manipulated accordingly to justify the outcomes sought. In this process we can forget those in communities whose lives we can either improve or detract from – it becomes a ‘data revolution’. We all gather more information than what we need and then discard the data we no longer need for the specific brief. In this process too often we tend to divorce the ‘local realities’ from the solutions sought. We must take stock of the work we do, recognise that research and the resultant data can be a powerful change agent and be primarily guided by the people we seek to affect by our work and the ‘realities’ in which they live. Not by ‘higher’ level agendas. Hence the researchers challenge is interpreting these local realities into policy, strategies and achievable actions. Re capability – The Forum suggested that general public awareness of what happens with data is important – it is not just about specialist ability to use and understand data. When people understand data flows, and have some control about how data about them is used, they are more likely to trust data-holding institutions, ultimately enabling use of data. Re making data available – It is important to realise that not all data can be made open – degress of openness is more realistic, and there are ways to support more sharing and use of data that don’t jeopardise trust. These are very important points. Open data and transparency must include transparency towards the public who are contributing to the data. When dealing with data sets like this, the “data points” are not abstract or inanimate objects, they represent intimate information about real people. It is therefore vital that these people are informed about what is being done with their data and that they have real agency in determining if and how data about them is used. Without this, the open data risks violating the human right to privacy and is likely to generate resentment that will turn people away from contributing. We shouldn’t just be asking about the contribution of a data revolution to accountability, but also about how to ensure the accountability of a data revolution. This is a question that the consultation doesn’t invite us to address, which I think is a shame (unless I missed it somewhere?). A data revolution is most desirable (or only desirable?) where the collectors and users of data are accountable for their actions, and where the data is put only to good purposes. So, why shouldn’t the institutions at the heart of the data revolution sit within the accountability regime that accompanies the goals, including a strong domestic democratic anchor? Both public and private sectors, and MSPs/PPPs should be subject to public scrutiny for their collection and use of data. This involves open data about the data revolution: who is planning on collecting what information; who will use it for what purpose; what the lines of benefit and finance are. The ‘revolutionary’ use of data, like every other means employed in the service of the SDGs, must be formally constrained by (at least) three demands that reflect the very idea of the SDGs – (1) environmental sustainability; (2) the principles of non-discrimination and equality expressed in the mantra of ‘noone left behind’ – and (3) individual human rights. If anyone is collecting data that isn’t compatible with these purposes as part of the effort towards the SDGs (and/or retaining it and using it in other ways), this needs especially close scrutiny and regulation. I would like to thank you sharing with us your ideas on key areas that need improvement in terms of #datarev. First and fore most, there’s a lot to be brought out when it comes to siting key areas for improving timely data collection for basic usage for both government and Int./Local Agencies. Uniquieness has to be created for timely collections. Organizations have to follow the timing of all activities that concern the processes. They have to prioritize the activities, either periodically or routinely. The major challenge in many organisations is that they postpone activities that involve statistical data collection thus hindering other processes within the organization. Another challenge is that most organizations transfer funds meant for periodical analytical checks for Monitoring & Evaluation “M/E” to other activities that need concern at that specified time; not putting in mind the need to get data right. I would like to thank you sharing with us your ideas on key areas that need improvement in terms of Data Revolution. (1) While improvements have occurred, the education sector continues to suffer from a lack of coordination, which affects data gaps, timeliness and lack of common standards. To a large extent, identifying and implementing solutions to problems in these areas, while far from ‘revolutionary’, would go a long way to improving the knowledge basis of the sector at very low cost. This is a key message for the International Expert Advisory Group. For example, there has been little coordination effort between international agencies and member states to identify countries for which no globally comparable information on education is available. This should be prioritized. Moreover, as already identified in a 2009 IHSN report, a core minimum of essential questions on education should be included in most, if not all, national or international surveys to promote comparability. Communication and coordination is also insufficient across surveys in different sectors (for example, health surveys include limited information on education/poverty), This limits the ability to draw associations and identify important links between education and other development priorities. (3) Despite the commendable work of Paris21, uneven data availability and the lack of transparency and openness in surveys continue to be problems. Some countries do not make international household survey data available (or do not encourage their use if the results portray a less optimistic picture). And despite a positive trend over the last 15 years, many national statistical institutions still do not make their household survey datasets public, even in some cases when they have received external funding. All these issues must be addressed in post-2015 data collection strategies. are used by older people and their organisations and others at grass roots level to inform and to lobby governments to make policy changes that will improve their lives. 2. Capacity building: what should be taught in schools, what new skills are required in national statistical offices, and how can individuals and organisations become more able to collect and use data to drive action and accountability? Digital literacy skills can and should be taught not only in schools but also to older people in a variety of settings, using age-friendly technology. Mobile technology can enable individuals and organisations to become more able to collect data. Gerontechnology, with its emphasis on designing technology and environment for independent living and social participation of older persons in good health, comfort and safety, http://gerontechnology.info/index.php/journal/pages/view/isghome is an important field to explore in terms of data assessment for ageing well and for technology which is age appropriate and age accessible. 3. How can the owners of data in both public and private spheres be encouraged or required to make data more available to whoever wants it? Data should be comparable between countries and be publically accessible. The Global AgeWatch Index is an example of an accessible tool to measure progress and citizens’ well-being. It is based on the premise of the HDI, with its domains and indicators drawn from a process of participatory consultation with 1,300 older people in 36 countries. These indices can be used to stimulate awareness and understanding of an issue and also serve to hold governments to account and provide examples of best practice. The Global AgeWatch Index, developed in 2013 to spotlight issues of data and policy responses to ageing is in this mould. It brings together a unique set of internationally comparable data, using 4 domains and 13 indicators, on older people’s income security, health status, capability (employment and education) and aspects of the enabling environment. In 2014 data gaps meant that it was possible to include 96 countries, representing 91% of the worlds over 60’s. Data used is accessible on the web and clearly signposted on the Index website. The Index highlights gaps in age-disaggregated data, clearly visible though its map of countries included in the Index, and has an aim of encouraging owners of data to improve data on ageing and make this available. (a) With regard to open data, it is important to make the distinction between the platform on which data is kept and the data itself. The data should always be open and publicly available but the platform does not necessarily need to be. Quality of data is another important aspect as low quality big data is as risky as no data at all. It is therefore crucial that standards and protocols on how to generate, make available and use data are provided and safeguarded by independent bodies such as UN and other Governmental Institutions. Without such protocols and standards, there is a significant risk of lack of quality and misuse. Protocols and standards are needed for any type of data. For sustainability information the challenge is even greater than other topics as sustainability attains to many aspects of the economy and human activities. The standard around the creation of corporate sustainability data is offered by GRI and made available as a free public good for all those who want to build on that. GRI is a common language for data on corporate sustainability impacts and has been developed through a robust global multi-stakeholder approach to create corporate sustainability disclosures which can be used as a basis to build all kinds of programs and initiatives. (b) More policies and regulatory measures that stimulate publicly available sustainability data from companies would allow investors, consumers and all other potential users to make more informed decisions. Furthermore, the transparency of this data would stimulate virtuous behavior and a positive contribution towards the implementation of the SDGs. (c) At GRI we intend to pay more attention to data users focusing on how we can help companies ensure that the information they disclose actually reaches their target audience and is properly communicated and correctly understood. In order to achieve this, the reported data need to be made available in a usable format that goes beyond the PDF report which is currently the most common sustainability reporting format. Making the GRI Guidelines available in an XBRL format has been an important first step towards this but our future focus will be on other ways to increase the accessibility of data as well as exploring ways to use the data in a meaningful way. Thanks for the useful comments already here! From the perspective of School of Data (http://schoolofdata.org), an initiative I work for which works on promoting data literacy with civil society groups and journalists from around the world to empower them in their work, there are a few things that come to mind. We focus very much on the ‘demand side’ of the data ecosystem, and provide both offline workshops as well as online (openly licensed) training materials. Our work has taken a very hands-on approach to using data; we use the model of the ‘data pipeline to illustrate how to work with data, the first step of which is ‘Ask a Question’ – which encourages people to dive straight into working with data, with a clear purpose in mind. Gaining the skills that they might need to achieve this comes along the way, and we try to do this in a fun way, through, for example, data expeditions, assigning people characters, and encouraging offline trainings to be exploratory and hands-on, rather than a very heavy, technical workshop to begin with. In order to use data for advocacy on a sustainable basis, people (in our case, those working in civil society organisations and journalists) need to know what is possible, and have the skills to do it themselves (rather than outsourcing, for example, or not making the most of the data out there, or data they are collecting themselves). We’ve found that often people believe that working with data has a very high barrier to entry; so, starting with a hands-on approach and encouraging them to get their hands dirty with the data from the very beginning makes it a lot easier to demonstrate the possibilities and debunk that myth. Also, we’ve seen that people often don’t understand the value of the data that they might be working with themselves, or how to access or really use other (open) data that might be out there already, that could support their work. Through the global School of Data community, we’ve learned a lot from different communities, by providing a space for people to share those stories, and connect with other data enthusiasts. In terms of making data available, and how best to do so – there are various initiatives thinking about this, for example through the Responsible Development Data book that was recently published (http://tiny.cc/rddevbook) . It includes various suggestions on things to think about when making data available, as well as what to consider when working with data, and planning development projects, in order to respect the privacy rights of people reflected in the data. Generally speaking, it’s a lot easier to convince people to open up their data if they can see the value of doing so, ie. if people on the demand side are really making the most of the data that is out there. From the perspective of School of Data (http://schoolofdata.org), an initiative I work for which works on promoting data literacy with civil society groups and journalists from around the world to empower them in their work, there are a few things that come to mind. We focus very much on the ‘demand side’ of the data ecosystem. Coordination is a key aspect of data collection. In order to avoid duplications of datasets and related costs, data should be collected only once, at the level deemed the most appropriate. Within a context where crowdsourcing is a major opportunity, it appears that the value of data changes. In the case of geospatial data, what has value today is not so much the production of the data itself, but more and more the trust a user can have in a dataset. This trust can be established through high transparency on how the data is produced, and through assessing its quality. What matters then is to ensure that a user knows what he can do with a given dataset, and what he cannot do. In the domain of geospatial data, this is particularly important, as mapping is a very ingenious way to communicate. This requires users (individuals as well as organisations) to be first of all trained on how to read and understand geospatial information and maps. Producing geospatial authoritative data that can be trusted entails costs, and requires specific skills. Who should produce them? National mapping and cadastral agencies have a key role to play in this respect, as they are mandated by governments to produce official geospatial data. The only way to enable the releasing of authoritative data as open data is to ensure their economical balance by funding them fully and upstream. In this case they are not required to generate revenues. Boundary layers must be open access in every EU states for environment management, conservation and sustainable planning. These fields can’t handle pure coverage data without boundary layers (for example: state boundaries, municipal boundaries, water related border lines, nature reserve areas, landfills, mines, etc). This type of data is essential for conservation organizations, universities, institutions, companies and individuals. Without it, accurate spatial planning of environmentally sound projects is impossible. At present, in Hungary this important data still traded in a high price.